– Based on May 2012 data released by FAFSA.GOV for YEAR 2012 – 2013. Not just US domestic schools, but also schools in other 39 countries/regions. Not just top notch colleges, universities or graduate schools, but also community colleges, job training programs even including beauty academy, bible school etc. – Instant search results display. 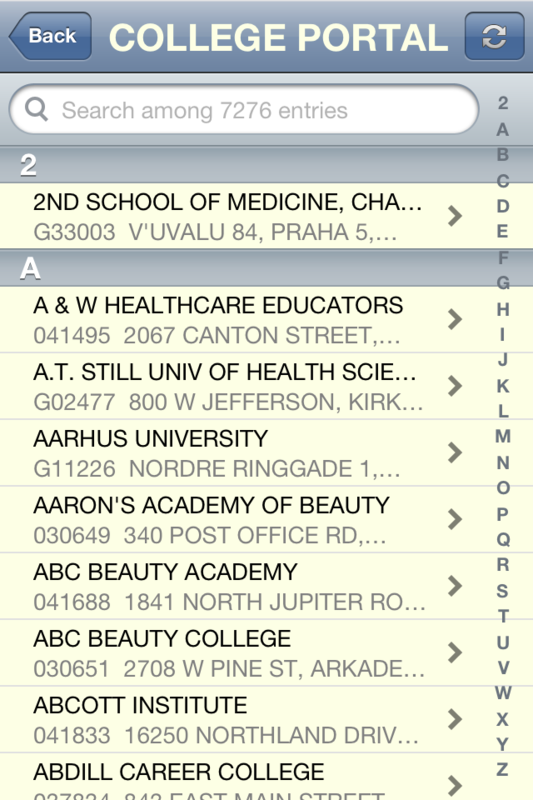 Search name, Federal School Code (FAFSA), Zip, and city. – Press and hold the email address on the webpage, send email for questions or program catalogs. – Mail the web page link to yourself or someone else. 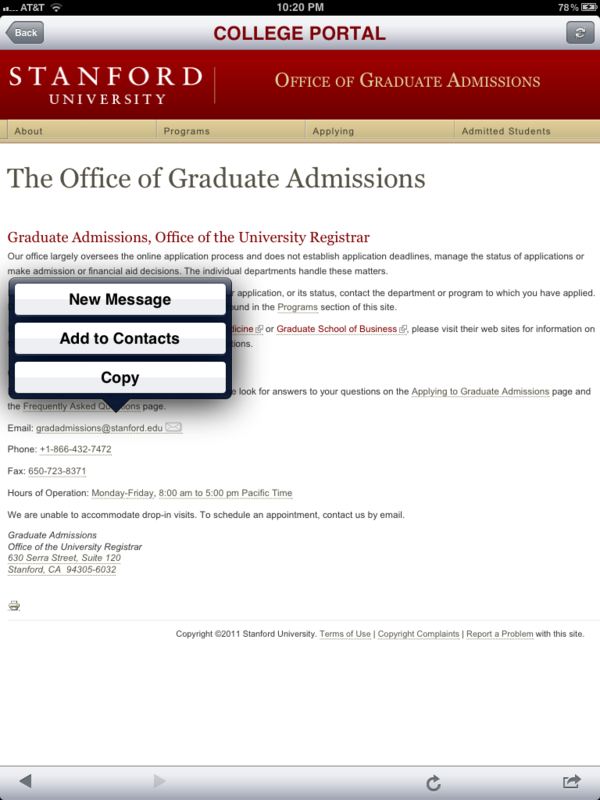 – Add email address on the web page to your contact for future use. If you are looking for colleges, universities, graduate schools, associate degrees, career training or secondary education with Free Application for Federal Student Aid (FAFSA) program, COLLEGE PORTAL is the ‘MUST HAVE’ App you should download. It is fast and easy. You have so many choices you may not be aware of yet. All of 7276 schools are in Free Application for Federal Student Aid program. Not only in US, but also including total 40 countries! Get FAFSA code, check location, browse their admission office website. Search by Name, FAFSA code, Zip, City. 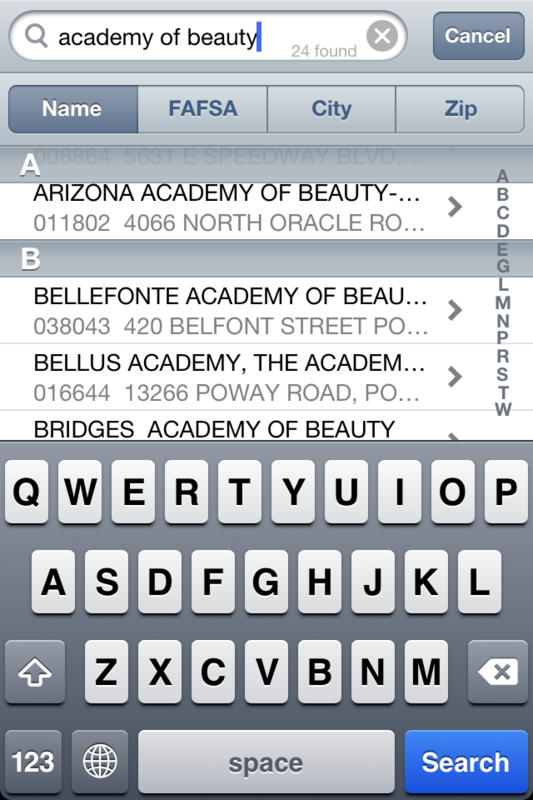 The search UI is so responsive that you can see the results instantly while you type! Check out the screen shots. 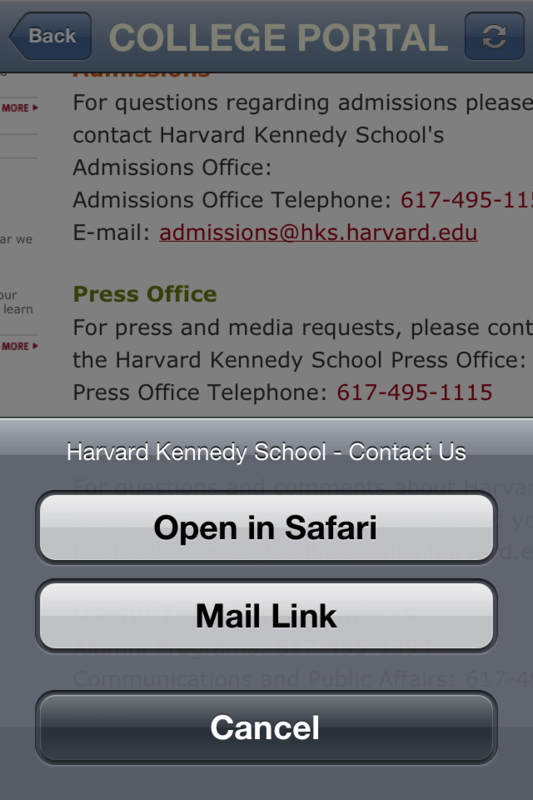 Once you find the admission web page, you send email for catalog or brochures, even ask questions. Add contact to your own contacts! Email yourself or someone else of the interesting school you find. Premium features: easy navigation – fast up/down, web page browsing , email link, remove ads. This entry was posted in College, FAFSA App, Financial Aid, iPad, iPad App, iPhone, iPhone 4, iPhone 4S, iPhone App, iPod Touch, iPod Touch App, Mobile. Bookmark the permalink.